Kale is a green leafy vegetable that is low in calories and is packed with an amazing array of nutrients. Kale is truly a superfood because it contains high levels of vitamins, minerals, fiber, and is virtually fat-free. Consuming more kale in your diet is good to help keep your heart healthy, improve your digestive health, reduce inflammation, and help you lose weight. There are many ways to eat kale as part of a healthy, well-balanced diet. You can eat kale raw, and you can also steam, blanch, or sauté kale leaves to tenderize the leaves while retaining its nutritional value. Quick cooking preserves kale’s nutrients, texture, color, and flavor. Rinse kale, chop it finely to ensure rapid cooking, and add it soups, stews, stir-fries, salads, egg dishes, or casseroles. You can steam kale for 5 minutes to make it more tender or simply eat it raw. You can also splash on the kale a little bit of lemon and olive oil to enhance its health-promoting qualities. Kale is also sold in a powder form which can be added into water, juices, smoothies or sauces, as well as in capsule form. You can even use kale as an ingredient in another fermented food such as sauerkraut or kimchi. In this article, you will learn what scientific research says as to the many reasons why a serving of kale is good for you. You will also find out about the nutrients that make kale such a great food to enjoy regularly. What is Kale and What Makes It a Superfood? Kale is a cruciferous vegetable from the Brassica oleracea species of plants, and is in the same family as cabbage and broccoli. There are many types of kale, and the shape and color of kale leaf determine the variety. Other types of kale include red kale and black kale. Some varieties of kale have purple-red leaves, deep purple leaves, or bluish-green leaves in varying shapes and sizes. Many people say that raw and blanched kale have a slightly bitter taste. Sautéing, frying in oil with garlic, or blanching are different ways to cook kale and soften the leaves. You can remove the tough stem from the kale leaves, roll them up or rub them together to soften them, slice thinly and add lemon juice and olive oil to make them taste better. Different types of kale also have different tastes. 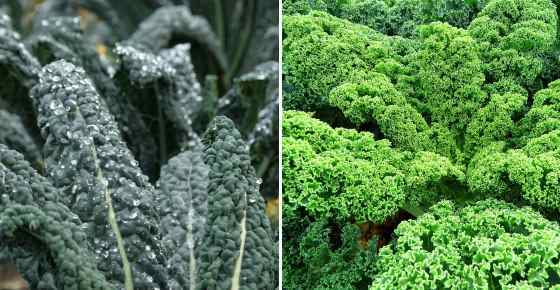 For example, comparing green kale and red kale, you may find that red Russian kale has a sweeter, milder taste. When studying the nutritional content of kale, it becomes easy to see why kale is a superfood. The mineral content of one cup of chopped kale (67 g) also includes 0.5 mg manganese (26% RDI), 0.2 mg of copper (10% RDI), 300 mg of potassium (9% RDI), and 22.8 mg magnesium (6% RDI). Kale is also low in carbs and is a great, healthy vegetable if you are on a keto diet. Although kale has slightly more carbs than broccoli and spinach, there are only 6.7 grams of carbs in a cup of chopped kale. Cruciferous leafy vegetables such as kale are good for your health because they contain powerful antioxidants in the form of phytochemicals. Learn how you can add kale to delicious cancer-fighting smoothies to help strengthen your immunity. Because kale nutrition content is so great, consuming kale in salads, smoothies, soups, and other meals can help benefit your health. Despite the fact that kale is an extremely healthy vegetable, there are some conditions where eating too much kale could be bad for you. Learn more about your thyroid hormones and about the signs of a thyroid disorder. Can Eating Too Much Kale Be Dangerous? Eating kale in moderate amount is not dangerous. The many health benefits of consuming kale in your diet generally outweigh any perceived risks. Let’s look in more detail at reasons why consuming kale is good for your heart, digestion, vision, immune system, and losing weight. The high levels of antioxidants in kale mean you can eat raw kale like lettuce or use it in cooking to help keep your cardiovascular system healthy. Find out about some of the easy steps you can take to significantly reduce your risk of a heart attack. Consuming kale juice daily can be good if you need to lower your cholesterol levels and improve your heart health. Learn about other delicious foods that have cholesterol-lowering properties. Another way that consuming kale juice is good for your cardiovascular health is that it can treat hypertension. If you suffer from high blood pressure, find out about more natural remedies for hypertension. Kale is a superfood containing vitamins and nutrients that can prevent vision loss and age-related macular diseases. Learn about other natural ingredients you can add to your super smoothies to help improve your eyesight. The high concentration of flavanols in cruciferous vegetables such as kale help to reduce inflammation in the body. Kale is a nutrient-dense food that benefits your overall health because antioxidants and vitamins in kale leaves boost your body’s defenses against disease and infection. One cup of chopped kale contains more than enough vitamin C, vitamin A, and vitamin K for your daily needs. Learn about some of the best natural supplements that can help boost your immune system to keep you healthy. Eating kale on a weight-loss diet is good because kale is a low-calorie, no-fat food that contains fiber, protein, and essential amino acids. One of the reasons why eating plenty of kale is good for weight loss is that it helps you feel full without lots of calories. Enjoying 3 or 4 servings of kale per week is good for keeping your digestion working. Kale is an important source of fiber that helps improve your digestive health. If you find that consuming kale causes you to have excess gas, learn about some of the best natural methods to reduce gas and bloating. Vegetables like kale have many beneficial compounds that help to fight off cancer and prevent tumor cells from spreading.